Lyda M. Torres Joins Freidin Brown, P.A. in Florida as an Associate Lawyer | Freidin Brown, P.A. Torres was born in Cuba, where she spent most of her childhood. Since moving to the United States at the age of 12, Torres has spent her life in South Florida. 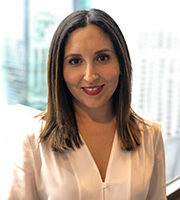 She is a graduate of Florida International University and the St. Thomas University School of Law, where she was a member of the Moot Court Board and the Intercultural Human Rights Law Review, and a competitor in the ABA National Appellate Advocacy Competition. She is now admitted to practice law in the state of Florida and handles cases involving catastrophic injuries, medical malpractice, tobacco litigation, and personal injury matters. She describes how her experiences living in Cuba played into her decision to pursue a legal career, saying, “As a young girl in Cuba, I saw firsthand the considerable societal damage when there is no legitimate justice system.” She goes on to explain, “I’m fortunate to now live in a country where the Constitution is revered and upheld every day, in a court of law, all over the country. I wanted to be a part of that,” she says. When she isn’t representing injured clients, Torres is raising a family and enjoys cooking and yoga in her free time. For more information about Torres or Freidin Brown, P.A., call 888-677-7764 today.